The standard way for Taurus applications to show one-dimensional data is by using a TaurusPlot widget. TaurusPlot is shown as an area with X and Y axes where curves (data sets) are plotted. It may also show a legend. But the TaurusPlot does a lot more than just showing a plot. It allows the user to interact with the plot in many ways as described below. The features described here are available by default in all TaurusPlot widgets, but certain GUIs may choose to disable some of these features. A TaurusPlot has a X axis and one or two Y axes (left and right, also called Y1 and Y2 and drawn in black and blue, respectively). Multiple curves can be displayed simultaneously and each one will be associated to either Y1 or Y2. By default, TaurusPlot only shows a legend when more than one curve is displayed (this behavior can be overridden using the TaurusPlot context menu). Curves associated to the Y1 axis show their title in the legend using black text, while those associated to Y2 use blue text. You can change the axis to which a curve is associated by clicking on its title in the legend. There are three states: associated to Y1 (black legend text), associated to Y2 (blue legend text), and hidden (the curve is not displayed and its title in the legend becomes gray). 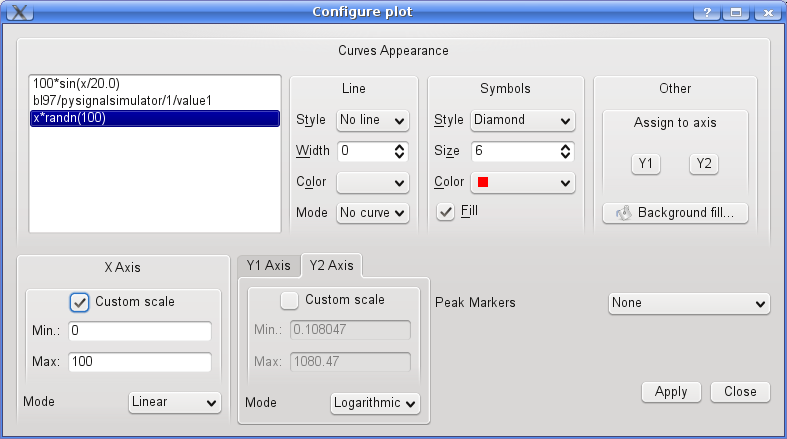 You can also change the axis to which a curve is associated using the Plot Configuration dialog. Right-clicking on an axis will show a context menu with the specific options for that axis. The plots can be zoomed in and out by using the mouse wheel over the plot area. Panning (i.e. translating without scaling) is done by holding the CTRL key down while dragging with the left button of the mouse. The ESC key resets the zooms and returns to auto-scale mode. Finally, all details about the scales are accessible at the Plot Configuration dialog. This dialog can be accessed from the TaurusPlot context menu. On its top section you can customize the look of the displayed data (line type, symbols used, colors, thicknesses, associated axis,...). Any changes will be automatically applied to all the curves selected from the list on the left. The curve titles can be changed by editing them directly in the list (one by one) as well as by selecting some of them and using the Curve Title(s)... button. custom scales. If the “Custom scale” check box is enabled for an axis, the range defined by the min and max values will remain fixed. If it is disabled, the axis will auto scale to accommodate all the data. Axis type: You can choose either Linear or Logarithmic scales. Note: non-positive points will be silently ignored when in logarithmic mode. ...then the Input data selection option from the TaurusPlot context menu is for you! 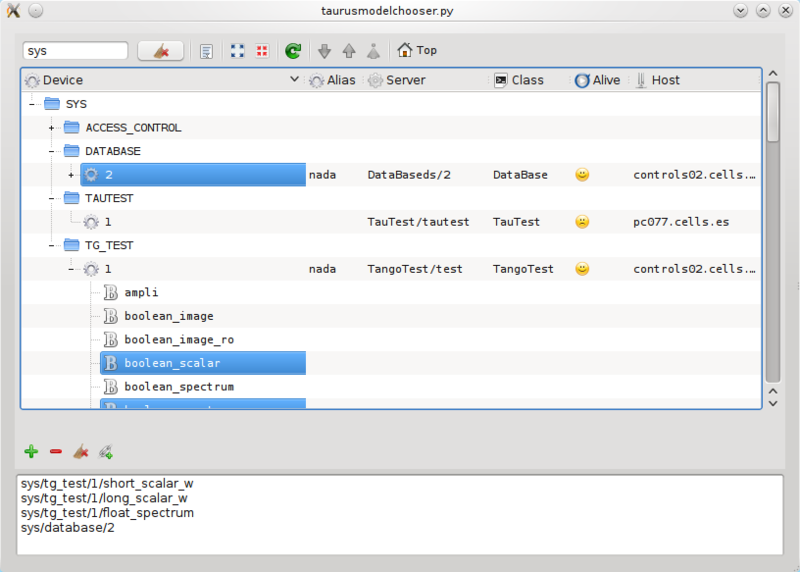 From the Attributes tab of the import data dialog, you can choose which Tango attributes are plotted, thanks to a TaurusModelChooser widget. You can add it by entering a mathematical formula. TaurusPlot will recognize many common functions (it evaluates the formula using a subset of numpy expressions). You can use x as a dependent variable, which you can set as regular steps or using an arbitrary expression. Note that there is actually no way to remove RawData curve from the GUI. 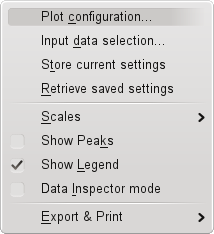 Once you have customized the way the plot looks (see the Plot Configuration dialog section), you may want to save the settings for later use. This can be done using the Save current settings option from the TaurusPlot context menu. This will save which curves should be plotted and how they should look. You can restore those settings at any point by using the retrieve current settings option from the TaurusPlot context menu. Obtaining coordinates of the plot area: you can get the coordinates (in the X-Y1 system) for any arbitrary point of the plot by simply clicking on it. You want a figure for a logbook? Or you want to store the plotted values in a file? Then you will like the Export capabilities of TaurusPlot. Create a PDF from the plot. Note that it is not a simple screenshot, but a proper vectorial PDF (this means you can zoom in without loosing resolution). saving all curves to separate files in one go. In some applications, the values of the X axis are interpreted as date/time values (this is set either by the GUI using TaurusPlot, or by the -xt parameter if TaurusPlot is being launched from the command line). When working in time mode, the X axis in the Plot Configuration dialog changes to “Time”, and the Min/Max entries change to Start/End, where you can enter a date (and, optionally a time). The date can be written in various formats. ISO format is recommended (e.g. “1917-10-25”), although others like, e.g. “25/10/1917” are also accepted. also, the keyword “now” (case-insensitive) can be used as a synonym of “+0s”. Taurus also offers an alternative widget for plotting one-dimensional data: TaurusCurveDialog. This widget is based on the guiqwt library and is currently less developed and tested than :class`TaurusPlot`.